1812—The frigate, USS President, captures British schooner, HMS L'Adeline, in the North Atlantic. 1841—Secretary of the Navy George E. Badger signs that the Chief Clerk's signature is valid on the certified copy of the medal citation awarded to Capt. Stephen Decatur, for his gallantry in action against the British frigate, HMS Macedonian, on Oct. 25, 1812. 1942—The submarines USS Nautilus (SS 168) and USS Argonaut (SM 1) land more than 200 Marines on Makin Island, Gilbert Islands, in the first amphibious attack made from submarines. 1943—Army troops enter Messina terminating the campaign in Sicily. Motor Torpedo Boat Squadron 15 conducts unopposed landings from motor torpedo boats (PT 215), (PT 216) and (PT 217) on islands of Lipari and Stromboli. Commander Motor Torpedo Boat Squadron 15, Lt. E.A. Dubose, accepts the unconditional surrender of the Lipari Islands (Alicudi, Filicudi, Vulcano, Stromboli, Salina and Lipari). Destroyer Trippe (DD 403) covers the operation. 1959—Adm. Arleigh A. Burke, is reappointed as Chief of Naval Operations for his third, two-year term, serving the longest as Chief of Naval Operations. 1962—The Navy's first hydrofoil patrol craft, USS High Point (PCH 1) is launched at Seattle, WA. 2002—USS McCampbell (DDG 85) is commissioned at San Francisco, CA. The Arleigh Burke-class destroyer is named for Medal of Honor recipient Capt. David McCampbell, the Navy's leading ace pilot during World War II. 2017—Expeditionary sea base USS Lewis B. Puller (ESB 3) is commissioned in a ceremony at Khalifa bin Salman Port in Al Hidd, Bahrain. The ship honors Lt. Gen. Lewis Burwell "Chesty" Puller, a distinguished combat veteran of World War II and the Korean War. The commissioning transitions the ship, previously a U.S. naval ship (USNS), to a U.S. naval warship. 1918—The first naval railway gun, a 14-inch, 50 caliber, Mark IV Navy gun mounted on a railway carriage, became operational in St. Nazaire, France during World War I. The "rail guns" operated until the end of the war. 1838—The Exploring Expedition led by Lt. Charles Wilkes embarks on a world cruise. 1908—The first Navy Nurse Corps superintendent, Esther Voorhees Hasson, is appointed. Under her leadership, 19 additional nurses are recruited and trained for naval service during 1908. 1943—USS Philadelphia (CL 41) and USS Boise (CL 47) and four destroyers shell Gioia, Taura, and Palmi on the Italian mainland. 1966—The first ship-to-shore satellite radio message is sent from USS Annapolis (AGMR 1) in the South China Sea to Pacific Fleet Headquarters at Pearl Harbor. 1995—USS Tucson (SSN 770) is commissioned at Naval Station Norfolk. The Los Angeles-class nuclear-powered fast attack submarine is the second to be named for the city in Arizona. 1812—The frigate USS Constitution captures the frigate HMS Guerriere, off Halifax, Nova Scotia after an intense battle. 1818—Capt. James Biddle, as commanding officer of USS Ontario, takes possession of Oregon Territory for United States. 1936—Lt. B. L. Braun, pilot, completes test bombing against the submarine USS R -8 (SS 85) off the Virginia capes, sinking the old submarine and proving the value of properly armed aircraft in antisubmarine warfare. 1943—USS Finback (SS 230) sinks the Japanese auxiliary submarine chaser (No.109) off the eastern Celebes. 1981—Two F-14 Tomcats of VF-41 shoot down two Libyan (Su 22) Sukhoi aircraft over international waters. Flying off USS Nimitz (CVA(N) 68), the Tomcats are on a reconnaissance mission for a missile-firing exercise being conducted by U.S. ships from two carrier battle groups when they are fired on by the Libyan planes. 2000—USS Oscar Austin (DDG 79) is commissioned at Naval Station Norfolk. The Arleigh Burke-class destroyer is the first ship named for Marine Private First Class Oscar P. Austin, who earned the Medal of Honor, posthumously, for his "indomitable courage, inspiring initiative and selfless devotion to duty" after he twice threw himself between a North Vietnamese weapon and a wounded comrade on Feb. 23, 1969. 2017—A team of civilian researchers led by entrepreneur and philanthropist Paul G. Allen announces they found the wreck of World War II cruiser USS Indianapolis (CA 35), which was lost July 30, 1945, in 18,000 feet of water. About 800 of the ship's 1,196 Sailors and Marines survived the sinking, but after four to five days in the water - suffering exposure, dehydration, drowning, and shark attacks - only 316 survived. In today's national news, top headlines include reports of a rare "fire tornado" from the fires in California was responsible for killing a firefighter, reports that the Department of Defense says the military parade originally scheduled for Veterans Day will be postponed, and reports that New York University school of medicine's MD degree program's current and future students will receive full-tuition scholarships. USNI News reported on the ongoing Education for Seapower study that is expected to provide a number of recommendations about how improve the way the Navy promotes, organizes and encourages learning among the ranks. One of the early themes emerging from the study is an increased focus on instilling critical and strategic thinking skills. Stars and Stripes reports that the USS Ronald Reagan began its annual fall patrol by training with the Japanese Maritime Self-Defense Force in the Philippine Sea. Additionally, Military.com reported on the first ever Arctic Maritime Symposium and the possibility for an increased naval presence in the arctic. Union gunboats attack Fort Sumter in Charleston, South Carolina, for the first time. Marine Raiders attack Makin Island in the Gilbert Islands from two submarines. Allied forces complete the conquest of Sicily. Upon hearing confirmation that Japan has surrendered, Sukarno proclaims Indonesia's independence. Three Americans complete the first crossing of the Atlantic in a balloon. 93-year-old Rudolf Hess, former Nazi leader and deputy of Adolf Hitler, is found hanged to death in Spandau Prison. Pakistani President Zia-ul-Haq is killed in an airplane crash suspected of being an assassination. President Bill Clinton admits to the American public that he had affair with White House intern Monica Lewinsky. A 7.4-magnitude earthquake near Izmit, Turkey kills over 17,000 and injures nearly 45,000. Israel begins the first forced evacuation of Israeli settlers from the Gaza Strip and northern West Bank, as part of a unilateral disengagement plan. Moscow's top court upholds ban of gay pride events in Russia's capital city for 100 years. A hundred years ago, on Aug. 18, 1918, the first naval railway gun became operational in France during World War I. 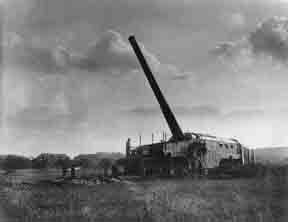 The Allies developed railway guns in response to the Germans' long-range artillery guns, such as the Leugenboom, that enabled the Germans to bombard Dunkirk from a distance of over 24 miles. NHHC's website includes several pages of detailed history on the railway batteries, as well as a large selection of historic photos from the period, including several of Capt. Charles P. Plunkett—later Rear Adm. Plunkett—who commanded the U.S. naval railway batteries. During World War I, the Allies were seeking a way to defend themselves from German long-range artillery guns and bombard the German supply and concentration positions behind the front. The solution came in the form of a "rail gun"—a 14-inch, .50-caliber Mark IV Navy rifle mounted on a railway carriage. 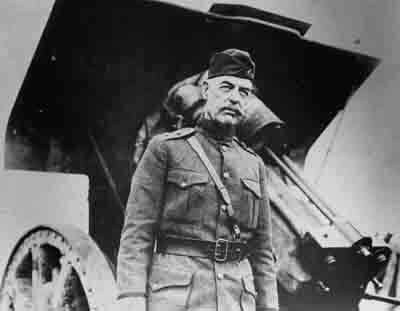 U.S. Navy railway batteries in World War I were commanded by U.S. Navy Capt. Charles P. Plunkett—later Rear Adm. Plunkett—and manned by crews of Sailors. Those assigned to U.S. naval railway batteries received training on how to put the guns in place, load, fire, and disassemble. They also learned to operate trains and locomotives, and build railway tracks. On Aug. 18, 1918, the first naval railway gun became operational in St. Nazaire, France. The batteries continued to operate until the signing of the Armistice on Nov. 11, 1918. A railway battery gun and mount used in France currently sit in Washington Navy Yard's Willard Park. To learn more about the U.S. Navy's railway batteries, check out this fascinating official history originally published in 1922. Really great piece of history. Battle of Athens (TN) 1946 !! I was completely unaware of this event that took place in Athens , TN in 1946. I did not know an armed revolt by WWII veterans ever took place during our lifetime. A very sobering video to say the least. Now it makes the second amendment even more clearer. A great little clip. Give it a view and pass it on!!!! This is apparently what happens when a guy is tasered. Next time "maybe" he will do as he is instructed - or not. It was the spring of 1967. Ho Chi Minh's Pride and Joy, the Thai Nguyen Steel plant, had always been on the US forbidden target list and had never been touched by a bomb. Located 35 miles northwest of Hanoi, the steel plant was the centerpiece of North Vietnamese Industrialization Program. The plant was an ideal strategic target - it was the only plant in the whole country capable of producing steel for railroads and bridges. However, the Navy A-6s added another dimension to the mission because A-6s were designed for night and bad weather attacks ... when they worked. Our first concern was A-6 reliability. To have any chance of success and survival, you needed a good working weapons system. On a mission of this difficulty that meant that at least the main video display, computer, inertial navigation system, search radar and radar altimeter plus the normal A-6 flight and engine systems had to function properly. If the Doppler radar and track radar worked, that was a bonus. Also the Electronic Countermeasures (ECM) and the chaff dispensers had to be operating to survive in the Surface-to-Air Missile (SAM) environment. If the weapon system didn't work you had to abort because you couldn't find, much less hit, the target using visual means alone. Then of course there was the issue of aircraft speed vs payload weight. Evading the defenses required high speeds, but at the same time, making a dent in the robust and large steel plant required lots of heavy ordnance. High speed and heavy bomb loads don't go together that well, especially in the hot and humid Southeast Asia climate. The best A-6 bomb load for the mission was 13 Mk 83 1000 pounders mounted on five triple ejector racks. This maximized the both the number of bombs and the weight of bombs carried on each aircraft, while retaining a 500+ knot potential if the engines were trimmed well. But it meant a max capacity catapult shot at 56,000 pounds at night into the spring monsoon. Five minutes out, one aircraft reported a weapon systems failure and turned back. When we reached the tankers over the water due east of the target, six planes successfully linked up and refueled. One A-6 was unable to accept fuel and returned to the carrier. Six A-6s turned to the west. During the practice attacks, just before going "Feet Dry," two more aircraft reported weapon system problems, and set a course to home. The 200-foot run-in altitude should keep our A-6s below the effective level of the NVN's FANSONG SAM radars and reduce tracking time for FIRECAN AAA radars. The high speed also shortened the tracking time for manually-aimed weapons. These tactics usually reduced the NVN to firing at engine sounds that left a trail of tracers arcing behind the aircraft but no damage. Only when the AAA was fired forward of the aircraft was the probability of damage high. The efficiency of the gunners could be checked by watching the tracer paths over the nose and in the cockpit rear-view mirrors. Judicious low level zigzagging helped avoid the heaviest flak. The low level run-in would be followed by a rapid pop-up maneuver to 1200-1500 feet, about ten miles from the target. This was needed to avoid damage from your own bombs. At 1500 feet and 540 knots the bombs would release about 1.5 miles before the target. After release the aircraft would be pulled into a 4-5G turn followed by a rapid descent back to 200 feet to escape the bomb blasts ... if everything went right. One plane thundered onward into the blackness ............. Alone. The weather over the North was poor, low clouds, drizzle and some fog ... good for an A-6, so very little antiaircraft fire was seen until reaching the Hanoi area. There the gunners were awake and using their ammo stockpiles to put up a barrier around the city. 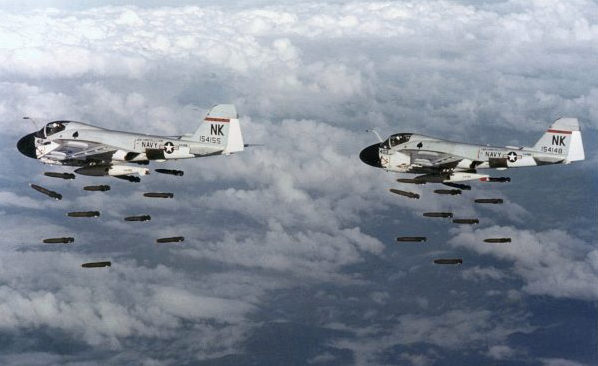 Quickly the remaining A-6's track turned north of the city to avoid some of the defenses and try to use the sides of the great Thud Ridge north of Hanoi as protection. But to get near the ridge the aircraft had to climb to 500 feet to clear some smaller hills. As the plane passed through 300 feet the intermittent sounds from the AAA FIRECAN radars became a constant buzzing. Then the deeper sounds of SAM FANSONG radar could be heard on the ECM equipment. Approaching 500 feet the FANSONG radar moved to high pulse repetition frequency (PRF) and the telltale rattle of a lock-on was heard in the cockpit. This was followed rapidly by the loud shrill tones of the APR-27 missile-warning receiver. Nicknamed the "warbler," the APR-27 sounded just like a European police car, and the sound increased when the SAM site guidance signal was aimed at your aircraft. The adrenalin flow in the cockpit was already high from being so far inside North Vietnam, but the rapid DEEDLE-DEEDLE of the warbler pushed the heart rate level up to a "double-pumper" – where both chambers of the heart are pumping at the same time to provide maximum blood flow to the brain. With increased oxygen in the brain, time seemed to slow down just as the night sky lit with the bright flares from SAM launches. The normal defensive move with a SAM was to maneuver to place the SAM at your 1 o'clock or 11 o'clock position for good visibility, and when the SAM was about 300 yards out go into a 4-5G barrel roll and dive out under the SAM. The small control surfaces of the SAM usually couldn't turn the SAM enough for a hit. That worked for the number #1 SAM, and usually for the #2 as well, if you had the speed and altitude. But #3 was often the killer. Eleven SAMs at 500 feet was an impossible task unless you can somehow break the FANSONG's lock-on. Technically, that meant jettisoning our bombs, radical maneuvers, max ECM, and chaff. 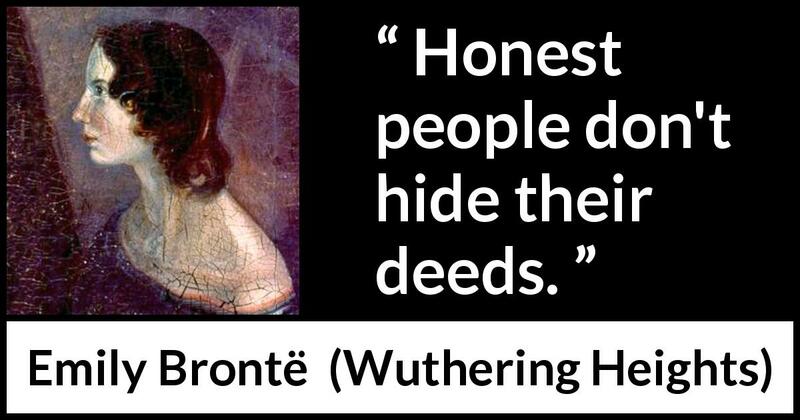 Mentally, that meant keen observation and good judgment. Morally, prayers were definitely pouring out of that cockpit. Then there was luck, lots of good luck, and we kept our bombs. To this day I cannot describe all the gyrations used to avoid the SAMs. I do know that somehow we never reached 1000 feet above ground level. I also know that we ended up about 15 miles off our pre-planned track. I distinctly remember seeing the ground light up in slow motion by the flash from an exploding SAM's 300-pound warhead. I also have no recollection of pulling any Gs but only high-G maneuvering avoided the SAMs. That's what a double-pump of blood flow will do for your senses. I do believe that the low altitude combined with the ECM's magic reduced the FANSONG's accuracy so that we could generate a miss with radical maneuvers. At low level the SAMs had to dive toward the aircraft to make a hit, and any kind of miss distance meant the SAM couldn't pull up so the SAM hit the ground or detonated in passing. All the A-6 received from the ordeal was some holes here and there, plus shrapnel stuck in the engine bay armor. As my heart slowed back down, the A-6 provided another surprise. Despite all the wild whifferdills, the weapon system was still locked on the steel plant! Even though the aircraft was now well out in the flat delta, away from the protection of the mountains and Thud Ridge, the system was still working and the attack could continue. The SAM sites would have to reload before they became a threat again. Even the ECM was quiet. Following the system's steering toward the target, I put the A-6 into Attack Mode. Now we were committed to the bombing run as we started a zoom climb to a 1500-foot release altitude. Then the horizon lit up from left to right. I had just enough time to think, "What the hell is that?" when AAA detonated all around the aircraft. My first reaction was disbelief followed by an instant and intense rage. We had just survived eleven SAMs and now the ! @#$%&* NVN were trying to shoot us down with old-fashioned guns. I started shouting: "You dirty *&%#, you couldn't hit me with missiles and now you are going to try guns, too!!! I'll destroy your whole @#$%&* steel plant, you *&%#." Directly forward through the intensive flak we flew until the familiar shudder of 1000-pound bombs releasing broke the spell. A "Bombs Away" call was followed by 4+Gs of a right break toward the nearest mountains and relative safety. Then the Air Force did its part to make our night complete. The Big Eye surveillance plane broadcast to the world at large: "Border Violation RED 60 miles north of BULLSEYE (Hanoi)." So now everyone knows that an A-6 is sneaking through the restricted zone near China, and where we are. A quick change of course and lower altitude hid the plane from our friends, but the violation reports continued for some time. Finally the northern Karst Islands slid under the aircraft, and the A-6 was truly "Feet Wet." A sigh of relief, turn the oxygen off, and now it's Marlboro time. We were totally drained after crossing back over the water, but then the black hole at the end of the boat was still waiting for us to screw up if we let our guard down now. Really all that's left is the hard part - another night trap in the goo. A two wire was okay that night. Item Number:1 Date: 08/17/2018 CHINA - AIR FORCE ENHANCING ABILITY TO HIT U.S., ALLIED TARGETS, SAYS NEW PENTAGON REPOT (AUG 17/CNN) CABLE NEWS NETWORK -- The Chinese armed forces are likely preparing for attacks on the U.S. and its allies, according to a new Pentagon report cited by CNN. China is expanding its fleet of long-range bombers and overwater operating areas, building experience in vital maritime regions and probably practicing attacks against U.S. and allied targets, says the Annual Report on Military and Security Developments Involving the People's Republic of China, which was published on Thursday. The Chinese air force is also seeking to add nuclear capabilities to its long-range bombers, says the report. This would for the first time provide China with the nuclear triad of bombers, submarines and silo-based launchers. China is also working on a nuclear-capable stealthy, long-range strategic bomber, which could enter service in the next 10 years. At the same time, the People's Liberation Army is in the midst of "the most comprehensive restructure in its history" to enable it to conduct joint operations, says the document. Beijing's growing capabilities come at a time of increased tension in the region. China has stepped up its rhetoric against Taiwan, threatening to take the self-ruled island by force if necessary. Analysts point to an increasing buildup of aircraft and missile platforms on both sides of the Taiwan Strait. To the south, China has continued its policy of building and maintaining artificial islands in the South China Sea, staking wide-ranging claims in the area and issuing warnings to aircraft and ships passing through the area. Item Number:3 Date: 08/17/2018 IRAQ - F-16S HIT ISIS MILITANTS PLANNING SUICIDE ATTACKS FROM SYRIA (AUG 17/REU) REUTERS -- The Iraqi air force has launched strikes in Syria that killed members of the Islamic State terrorist group (ISIS), reports Reuters. Iraqi F-16 fighter jets struck an ISIS "operations room" where members were meeting, the Iraqi Defense Ministry said on Thursday. The terrorists were planning suicide attacks on civilian targets within the coming days, the ministry said. The location of the strikes was not announced. The defense ministry did not release casualty figures. Iraq declared victory over ISIS in December 2017. Regional and international militaries have succeeded in dislodging the group from most of its territorial holdings, but this has not prevented ISIS from launching attacks in Iraq and Syria. Item Number:4 Date: 08/17/2018 ISRAEL - BARAK 8 AIR DEFENSE SYSTEM CHOSEN FOR NEW CORVETTES (AUG 17/IAI) ISRAEL AEROSPACE INDUSTRIES -- The Israeli Ministry of Defense has awarded a contract to Israel Aerospace Industries (IAI) for Barak 8 air and missile defense systems for the navy's new corvettes, reports the defense firm. The Barak 8 systems will be installed on four Sa'ar 6 corvettes ordered in 2015. The ships are slated for delivery from 2019 to 2021, reported the Jerusalem Post. No financial details were provided. The Barak 8, jointly developed with India, is designed to defeat aerial threats at ranges of up to 90 miles (150 km). The system features a digital radar, radio-frequency seekers, data link and network connectivity. Item Number:5 Date: 08/17/2018 ISRAEL - NETANYAHU UNVEILS 2030 SECURITY CONCEPT (AUG 17/TOI) TIMES OF ISRAEL -- Israeli Prime Minister Benjamin Netanyahu has outlined his security plans for the next decade, reports the Times of Israel. On Wednesday, Netanyahu presented the 2030 Security Concept to the Cabinet. The document covers additional spending, likely threats, military personnel requirements and principles for the use of force for the next decade. The concept, developed over the last two years, calls for an increase in defense spending of 0.2 percent to 0.3 percent of gross national product (GNP), with an average annual growth of 3-4 percent and an average security budget of 6 percent of GNP. The increase would amount to between US$630 million and US$950 million based on the current US$316 billion GNP. The additional funds would be used to strengthen offensive and cyber capabilities; upgrade defense systems; protective measures; and the completion of security barriers along the border with the Gaza Strip. The increased defense spending would also ensure further economic growth, which is needed to improve Israel's status and diplomatic strength, said Netanyahu. The plan must still be reviewed by the Knesset Subcommittee for the Intelligence Services, IDF General Staff, Shin Bet security service and the Mossad intelligence agency. Item Number:7 Date: 08/17/2018 PHILIPPINES - 2 KILLED IN CLASH WITH SUSPECTED NPA REBELS (AUG 17/PDI) PHILIPPINE DAILY INQUIRER -- A Philippine soldier and a suspected communist militant have been killed in fighting in the northern Philippines, reports the Philippine Daily Inquirer. On Thursday, fighting broke out between the 95th Infantry Battalion and 40 unknown gunmen, said an army spokesman. The clash came a day after the New People's Army Central Isabela Front claimed responsibility for the disarmament of members of Task Force Kalikasan, who were manning a checkpoint in Sindon Bayabo village near the city of Ilagen in the northern Isabela province. The rebels alleged that task force members have engaged in extortion and human-rights violations including escorting illegally cut logs from the mountains to log ponds or stockpiles. Item Number:9 Date: 08/17/2018 RUSSIA - LONG-RANGE BOMBERS MAKE 1ST TRAINING FORAY TO NORTHEAST (AUG 17/MOS) MOSCOW TIMES -- Russian long-range bombers have conducted their first training flights to the far eastern region of Chukotka, reports the Moscow Times. Th exercise included about 10 Tu-160 Blackjack bombers, Tu-95MS Bear long-range bombers and Il-78 Midas aerial tankers, the Russian Defense Ministry said on Thursday. The drills were to include strikes on simulated targets, reported Xinhua, China's state news agency. Two Tu-160 bombers landed on the Russian side of the Bering Strait after flying 4,350 miles (7,000 km) from their home base. The aircraft later departed for the Saratov region in southwest Russia, crossing the Arctic Ocean, said the defense ministry. The Tu-160 can carry up to 12 short-range nuclear missiles and reach a top speed of 1,240 mph (2,000 kmh). Item Number:10 Date: 08/17/2018 RUSSIA - UPDATED TU-22M BOMBER DEBUTS IN KAZAN (AUG 17/TASS) TASS -- Russia has debuted the latest variant of its Tu-22M long-range bomber, reports Russia's Tass news agency. The Tu-22M3M, which was rolled out on Thursday, will be capable of carrying Kh-32 air-to-surface cruise missiles and hypersonic weapons, Viktor Bondarev, the head of the Federation Council Defense Committee said. The updates on the bomber also include improved ergonomics in the cockpit, updated communications equipment and the SPV-24-22 digital specialized computer subsystem that will allow the bomber to use the Glonass satellite navigation system. About 30 planes will be upgraded to the same specifications, Bondarev said at the unveiling in Kazan. The Tu-22M3M is modified version of the Tu-22M, which first entered service in 1989. The upgrades will focus the bomber's abilities on striking sea and ground targets at a distance of up to 1,370 miles (2,200 km). The newly upgraded bombers will now begin ground and flight tests, reported China's Xinhua news agency. Testing may include flight tests of the Kinzhal hypersonic cruise missiles, a defense industry source told Tass. Delivery of the modernized bombers is scheduled to begin in 2021, said United Aircraft Corp. officials. Item Number:16 Date: 08/17/2018 YEMEN - KEY AL-QAIDA BOMBER MAY HAVE BEEN KILLED IN YEMEN, SAYS U.N. REPORT (AUG 17/CNN) CABLE NEWS NETWORK -- The bombmaker behind a 2009 Al-Qaida plot to destroy a U.S.-bound airplane on Christmas Day may have been killed last year in Yemen, reports CNN. Al-Qaida began suffering heavy losses in Yemen by mid-2017, according to a U.N. report from June. Some countries began telling U.N. experts that Ibrahim al-Asiri might have been killed in that fighting. Given Asiri's role as a bombmaker, such a loss could represent a substantial blow to the terrorist group. The U.N. report did not suggest how he was killed or who he was fighting at the time. U.S. officials told CNN that they were looking into the account. Asiri's group, Al-Qaida in the Arabian Peninsula (AQAP), has not released a statement eulogizing him, which is a common practice for the group. Experts said he should not be considered dead until such a eulogy is issued. Asiri is believed to have played a key role in planning and executing the 2009 plot carried out by Nigerian Umar Farouk Abdulmutallab. Abdulmutallab tried to blow up an airliner as it was landing in Detroit The son of a Saudi military officer, Asiri developed miniature bombs with little to no metal content that could pass airport security restrictions. The most recent public statement distributed to Asiri came in September 2017, marking the 16th anniversary of the Sept. 11 attacks in New York and Washington.